Guiding you back to the quests of the soul, through the realm within, by the guidance of the spirit of your soul. Vince Peña specializes in intuitive readings, energy and chakra clearings, crystal healings, home energy clearings, and more. Early in childhood, Vince became aware of the voices of his guides, and was told he had a “gift,” but didn’t understandexactly what it all meant, so he learned how to shut it down by occupying his mind with outside sources. But, Spirit was strong with him; his Guides persisted, and Vince still received visions of events that occurred elsewhere. At the age of 30, he saw his first spirit (or as muggles would call them, “ghosts”). They were the victims of the OJ Simpson murders, Nicole Brown Simpson and Ron Goldman. They were very clear in sight, walking inside and outside of the murder scene, waiting for their murderer to be brought to justice so they could pass completely to the other side. This gave Vince the jolt to start practicing his gifts. His abilities became stronger and he began The Divine Concourse of Spiritual Awakenings to help guide others to their true destiny and their true love in life. He is looking forward to reading and guiding you through your journey. With the assistance of our Spirit Guides, we will mentor you through areas of transition in your life (growth, career, relationship, breaking unhealthy patterns, supporting and encouraging your new spiritual gifts, a new business). We will have weekly 50-minute healing sessions via In-person, FaceTime, Facebook Video Messenger, Skype or Phone where I will intuitively interpret what our Guides are messaging; I will do some energy clearings and healing as needed. We will find clarity to break down those barriers that keep you from moving forward. We will watch how you become stronger and more positive about your journey. And we will see the beginnings of you starting that journey to success and happiness. You will also have some homework to do on your own. This is not magic. This requires your active participation to get the energy flowing. So please be prepared to face truths and letting go of a lot of situations keeping you from moving forward. That said, our healing sessions are designed to be light filled. We will look at the patterns that are happening in your life. Through healing, forgiving, and compassion we will start to break down those patterns, so you can feel the freedom of moving through your journey with love and understanding. You will leave each healing session with the feeling of lightness, inspiration, and a connection with your Higher Power. This is a 12-week commitment. We need the time for you to let go and heal what took a lifetime to create. I look forward to being a part of your successful journey! Oracle and Angel Card Readings (communicating messages from your Spirit Guides and Angels) – Using both of our energies and listening to our Spirit Guides and Angels, I am able to read the cards and give meaning to your questions. You will draw your cards, and I will read them and listen to what the Guides are telling me to communicate to you. Your Spirit Guides and Angels are here to help you. Send me 2 questions via the NOTE Section of the Scheduler below and I will ask my Guides, using the Cards and/or the Crystals to give meaning to your questions. I will reply via Email with your reading within 2 days. 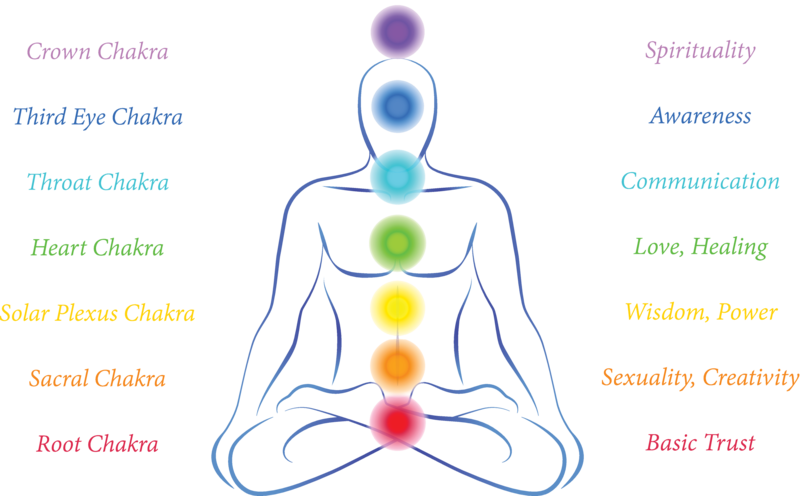 The Seven Chakras are the centers in our bodies in which energy flows through. Blocked energy can often lead to illness. It is important to understand what each chakra represents. I am able to see energy blocks throughout your chakras and will clear those blocks so that your energy flows freely. A 15 minute Intuitive Reading and an Energy/Chakra Clearing combined. Does your home have a feeling of negativity? Do you feel like there are unwanted spirits with you? Do you have problems sleeping or are having bad dreams? Is there a lot of arguing going on where you can cut the tension with a knife? Health issues? Electrical issues? Feeling depressed? Feeling stuck in life? Did you just move into a new home? Or are you just wanting peace, happiness, and abundance in your home? Sounds like your home needs an energy clearing. I will come to your home and, using my Spirit Guides and other resources (sage, palo santo, essential oils, and sound healing tools), I am able to clear those unwanted feelings and situations so that the energy feels light and free, creating harmony and peace in your surroundings. Do you have a situation that keeps you in fear of obtaining what you desire? Is there someone in your life that you want to break away from in a positive way? These are items in your life that no longer serve your greater good. We all have many cords attached to us. Some of them come from past lives. These negative cords keep us in fear and keep us from moving forward. Unhealthy cords can be a huge drain or a means of control. I am able to assist you with cutting those negative cords. Creating healthy boundaries with you and those around you. And opening you up to abundance. I use a variety of crystals and other stones as conduits for healing. Allowing positive healing energy to flow into the body as negative energy flows out. I place the crystals on different parts of your body that coincide with your chakras and around your body making an energy grid surrounding you with healing energy. Your office is where your money is created. Clearing your office will improve the flow of abundance in many different forms. I will come to your office and, just as I do with your home, I am able to clear the energy so your stress and fears reduce, and abundance can flow freely and more rapidly into your life. Using my Spirit Guides and Angels, I mix an elixir made with essential oils, positive energy, and love. I package it in a convenient spray bottle to be used to clear your energy and aura. Giving you clarity and a fresh, free feeling. There is a $4.00 fee added to credit card purchases.